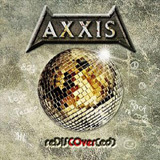 Axxis being one of my all-time favorite bands, a band I follow since day one, I was pleasantly surprised when I heard they would make a cover album of classic Disco songs. I'm a huge fan of similar efforts by Northern Kings, so of course having Axxis do one of these seemed fun. What is important to understand is that this isn't really an Axxis release in the sense that it won't sound too much like the band's current and past releases. Of course the unmistakable and beautiful vocals will instantly bring Axxis to mind, but somehow that's where the similarity ends. Unlike the previously mentioned Northern Kings that actually tried very hard to twist the songs and somehow make them their own (on top of investing into an incredibly orchestral sounding production), Axxis plays it safe with the original material, just adding a guitar here and there and letting good musicianship and great vocals do the rest of the work. This is not particularly a bad thing, however it won't rock your boat and will deliver very little surprises. For those who like Power Metal then they will surely remember Sonata Arctica's ingenious cover of Scorpions' Still Loving You, making it into a speed metal song was ballsy, but it worked (gave me goose bumps), it totally caught everyone off guard at first listen. So while I enjoy this release, I don't see it as a milestone for the band, more like a footnote and a nice distraction until their next album gets out (that I'm very impatient to listen to). The one thing that shines throughout is how Bernhard manages to change his voice and adapt it to each song, in Staying Alive it's a real tour-de-force in my opinion. But if you take I Was Made For Loving You, one of my all-time favorite KISS song (so I had too much expectation for this one), it fells a little flat (don't get me wrong it's still one of my favorite tracks and has great energy throughout). It's one case that perfectly illustrate where taking risks and adding Power Metal double bass and stronger guitars might have paid off… especially in the chorus, maybe a bombastic choir and stronger drums would have had more impact (I'm just guessing here). Instead the song is simply too close to the original… On most covers the songs still breathe of fresh air due to the vocal prowess, but I can't help it and feel that these covers could have used more guts (read METAL). I'm not sure why My Heart Will Go On is here, it's guitars make the song more interesting but this is one case where Bernhard cannot fairly compete here, though if there's one metal singer that can approach Céline (not a fan but I can recognize an amazing voice when I hear one) it's definitely him. Most singers know how tough it is to sing this song, so hats off for the vocal performance even if it's not matching the original. Somebody to love is a great song, but there's already a cover that owns it in the metal world (W.A.S.P). It's a great version too, but I slightly prefer Blackie's rendition (ballsier). My absolute favorite track has to be Message In A Bottle, and I'm not even a Police fan :), but the stronger drumming and guitars make it more metal and the delivery is very energetic on that one ! This is definitely more for the fans, and as such I appreciate the release, but the fact that the songs stay very true to their original makes it a very little surprise release. Loving Axxis to death, I am happy with everything new I get my hands on from them and there are some really nice covers here. As you know don't quote cover albums. Fans like me will appreciate it for what it is, just don't except to get a true Axxis album, this is not what ReDISCOver(ed) is. What it is though is a fun distraction and in that regard I'd say that it's mission accomplished.